Folks, don’t try this at home. The project turned out great but it’s not a technique I would recommend using. I thought I would share the project just to show that sometimes the best ideas…aren’t. The JTS bought the stool at a local auction. He was told at the time that it’s a goat milking stool. Could be, I’ve never milked a goat. 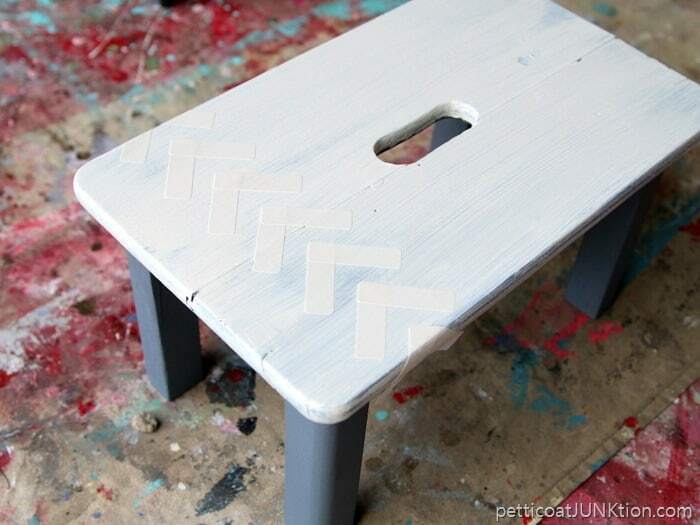 The stool was okay as is but paint makes most things better. 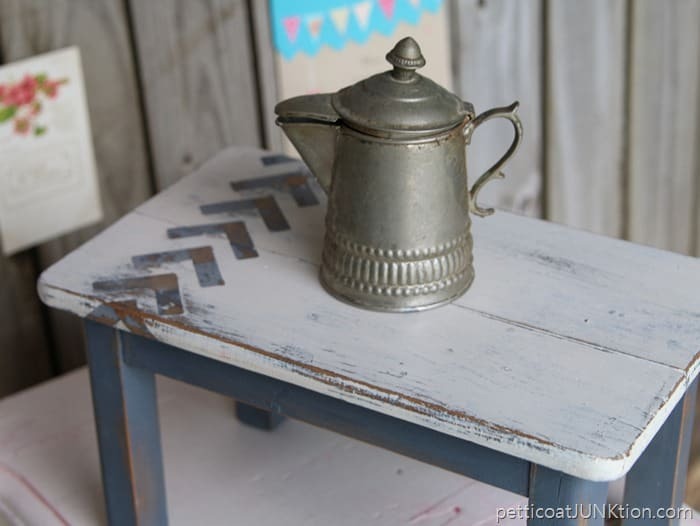 I spray painted it with RustOleum gray primer to prep for a coat of white spray paint, then distressing to show the gray. Then I got to thinking about putting small white circles on the top of the stool. I still like the dot…or circle…..decorated decor. Is that look still in style? I’m usually not in style anyway. I couldn’t find the stickers I use to make circles but I did find these adhesive labels hanging on the pegboard in the workshop. 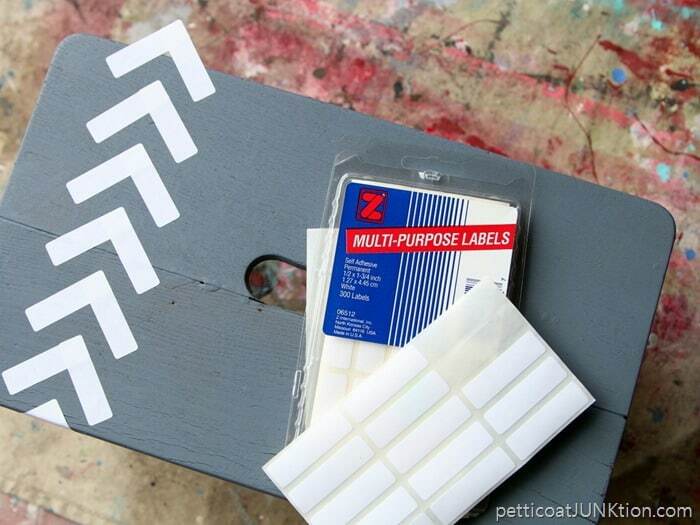 The “arrows” are a popular design so I stuck the labels on to make arrows and started painting. This post contains affiliate links to products used in this project. I painted the top with off-white Reclaim paint. I applied one coat of paint, let it dry, then applied a second coat. Then this happened. I started peeling off the labels and the layers of the labels separated. The adhesive part stayed stuck to the stool and the top label layer pulled off. And I couldn’t get most of the label gunk off. What a mess. 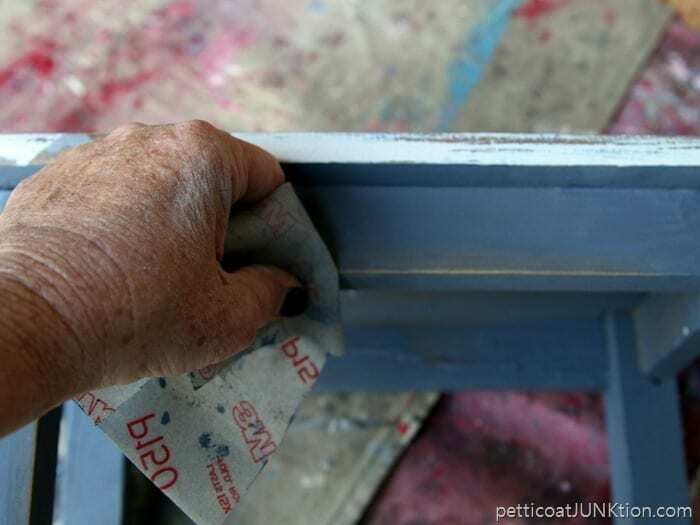 I think it would have been okay if after applying one coat of paint I immediately removed the labels. But I didn’t do that. At that point I decided to get the sander and remove all of the paint from the top of the stool. But first I took a small piece of sandpaper (my new favorite 3M flexible sandpaper!) and just distressed the heck out of the top. 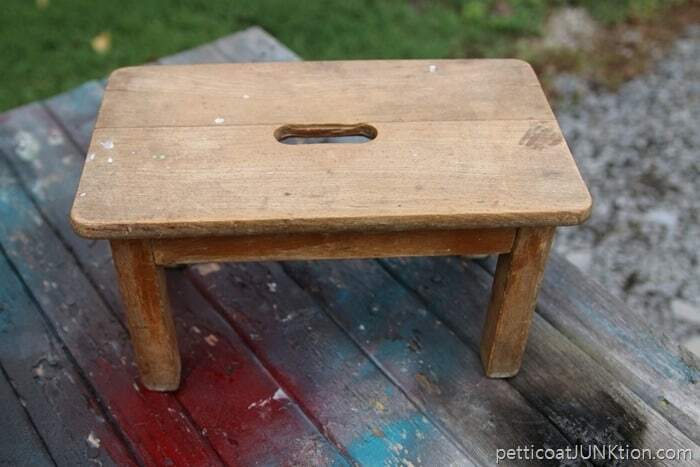 And I liked the stool then, a lot. I applied a coat of clear wax to protect the paint and give it a little sheen. 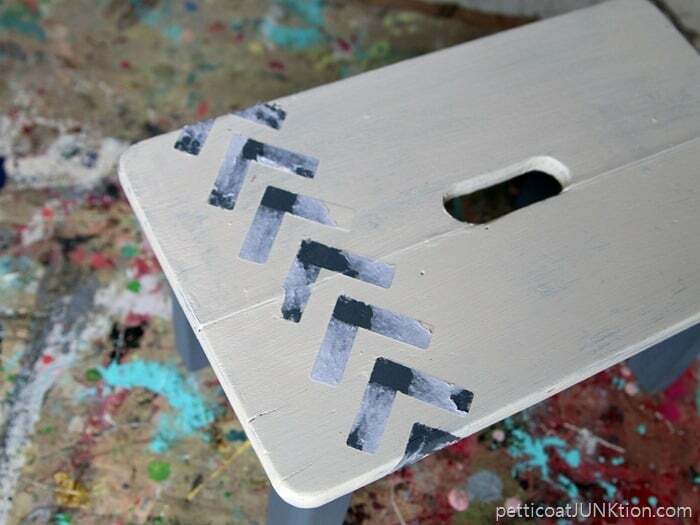 Then I distressed the bottom part of the stool. Ta-dah! 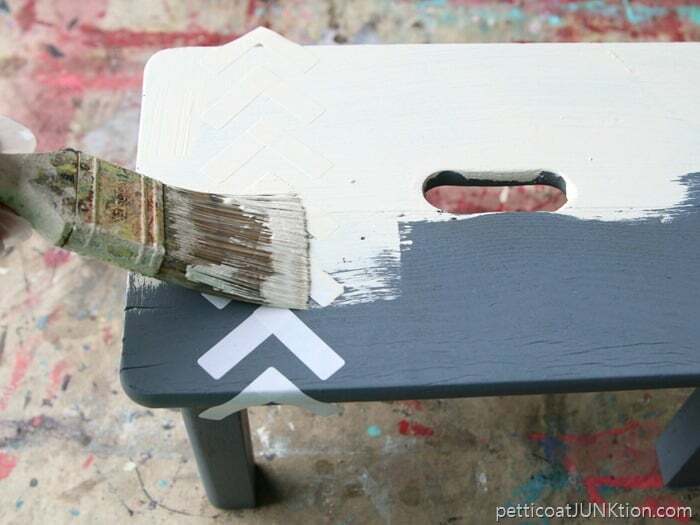 Shabby white and gray paint. And a cute little design. I like the look. I actually think it’s perfect, but I’m not going to try that technique again…unless I paint and pull….right away. Have a great day guys and I’ll see you tomorrow for themed furniture day. My project for tomorrow is a doozy. Did you get a look at all the Fall Decor on Monday? Click here for the post….Fall Mantels, Tablescapes, Wreaths, Porches, and Printables. Thanks Valarie! I like that! I think the stool turned out perfect. I really like it. At least you were able to rescue it! A goat stencil might have been cute! 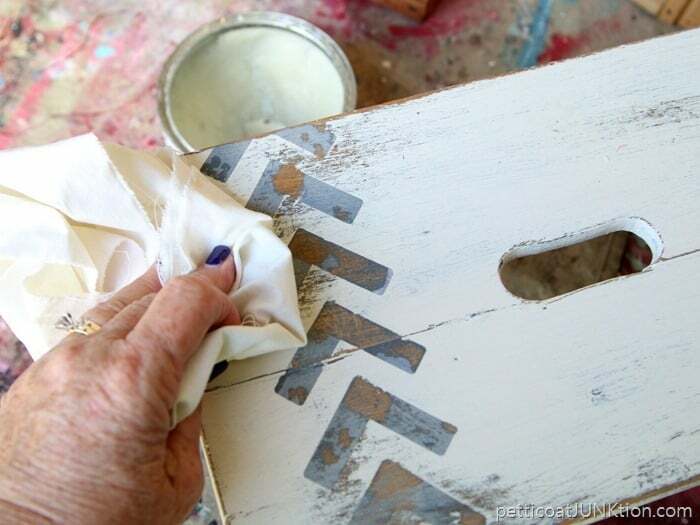 This little mistake turned out fabulous – how cute! Oh Kathy! Boy I can relate! I tend to allow a certain amount of time for a project assuming it will be done and off to my booth by a certain day! Oh how God laughs at my assumptions! The stool is just right. Great job! 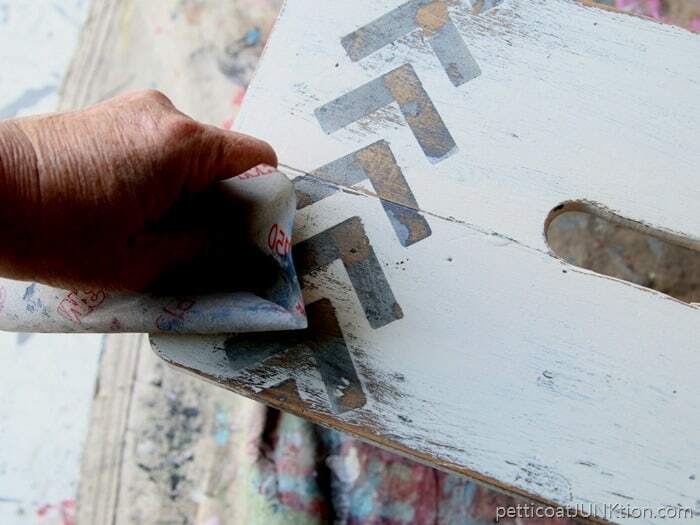 Love the depth of distressing…great job. Maybe next time use painters tape?? 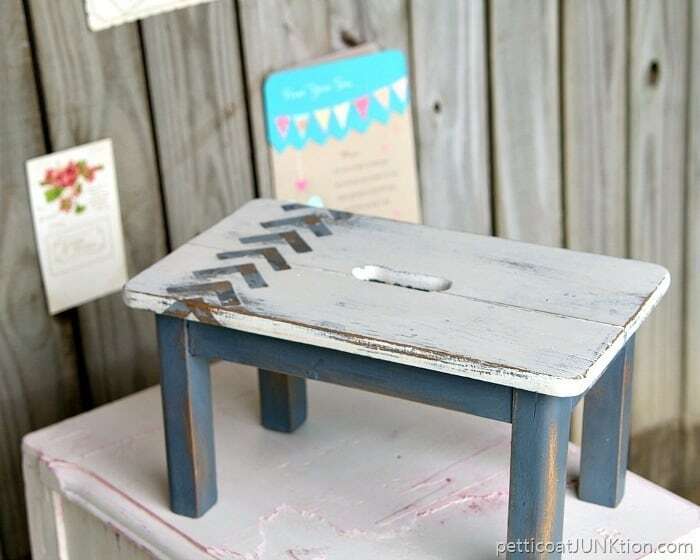 What a cute little stool! 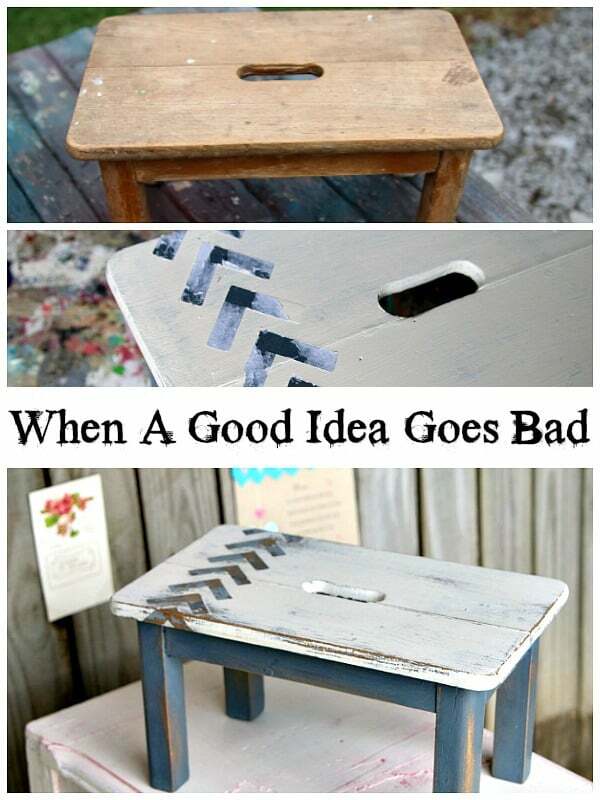 Despite the problem with the Sticky tabs the little stool turned out super cute. 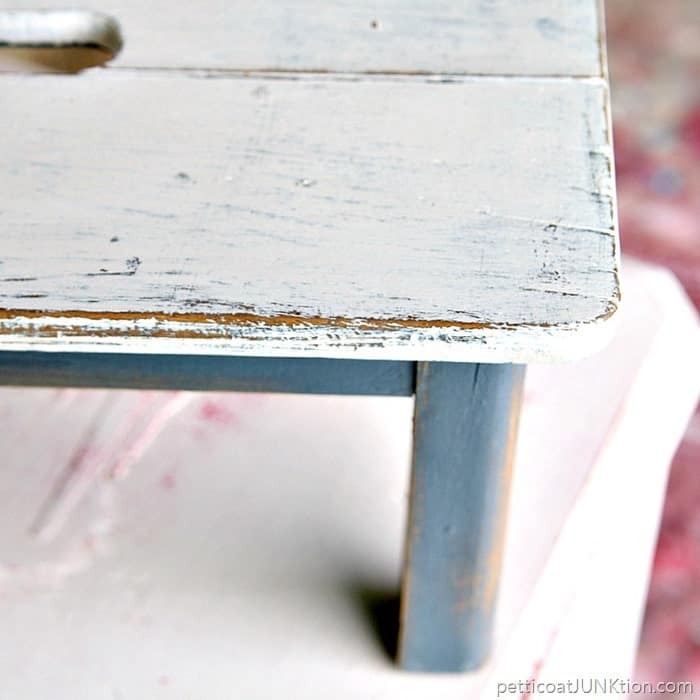 Love the colors and the distressing.